Pronouns are words that replace nouns in a sentence. 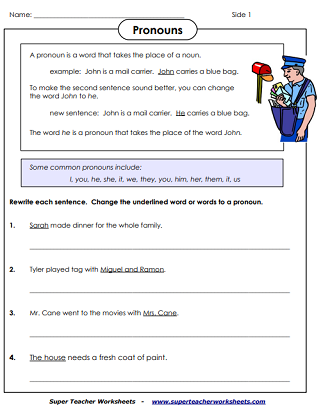 Use these printable activities to help you teach your students about pronouns. Part 1: Rewrite each sentence. Change the underlined nouns into pronouns. Part 2: Circle the pronoun in each sentence. This worksheet has 4 tasks. First, students define the word pronoun. Then they circle pronouns in the sentences. Next, they write a sentence with two pronouns. Finally, they explain why a pronoun is incorrect in a given sentence. Part 1: Match each group of words on the left with the appropriate pronoun on the right. Part 2: Replace the underlined words with a pronoun. Choose the correct pronoun to replace the underlined words. 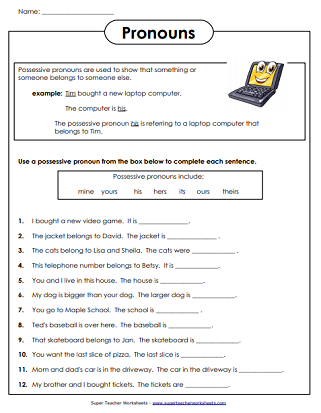 Use the possessive pronouns from the word box to correctly complete each sentence. Circle the relative pronoun in each sentence. Underline the noun that it modified. Then draw two lines under the adjective clause. Use a reflexive pronoun from the word box to complete each sentence. For each pair of sentences, circle the pronoun in the second sentence. Then find the noun that it replaces in the first sentence. Find the pronoun in each sentence, then tell whether the pronoun is singular or plural. Rewrite each sentence. Replace the underlined words with an appropriate pronoun. Decide whether you should use the word I or me in each statement. This worksheet has a box to describe the different between the pronouns I and me. Then write the correct word on the blank lines to complete each sentence. The words I and me are first person pronouns. Choose the correct word to complete each sentence. Choose the correct word to complete each sentence. Choose from this, that, these, and those. Note: These words are not always pronouns, they can also be adjectives or adverbs. 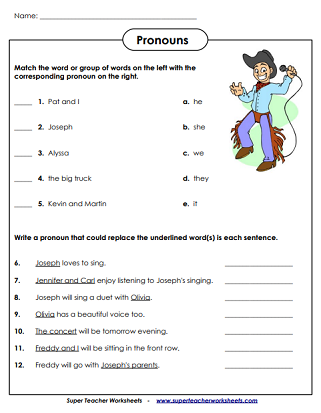 Worksheets for all parts of speech, including nouns, verbs, adjectives, and adverbs.